After fourteen years, I still wonder how that malignant tumor grew in my breast. I think of the risk factors we know about. Did I smoke? No. Was I overweight? No. Did I drink alcohol? No. Do I have a BRCA gene mutation? No. I do not know why I got breast cancer when I was only twenty-seven years old. We have been saying that we need to look in new places for the cause of breast cancer. This study does just that. The researchers are comparing differences between the intestinal bacteria of women who were diagnosed with breast cancer within the last 5 years and those who have never had breast cancer. They are also studying the intestinal bacteria of women who have not been diagnosed with breast cancer and have a first-degree relative (mother, daughter, or sister) WITH breast cancer. Sound interesting? Please click here to keep reading and to learn more! ← Is NaBloPoMo Over Already? That's really interesting. I've never read about a possible link to breast cancer from bacteria. Thank you so much for posting this. Especially since we could actually help research even if we have not had breast cancer ourselves. I checked out the website and will be very interested in following this. Praying they find the cause of this horrible disease. Thanks so much for sharing the information. Hope you have a wonderful Christmas holiday with your beautiful family! So interesting. Thanks for sharing that information. It goes in line with what my integrative doctor is doing to help balance my good estrogen with my bad estrogen. He believes all health begins in the intestinal tract. It will be very interesting to see what these findings are. 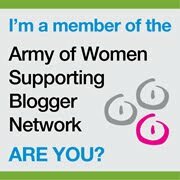 I'm also not familiar with the Army of Women site so am off to check that out. Thanks for keeping us informed! Ginny Marie,I keep saying I must look into this army of women site. One of these days I need to just do it. Thanks for the info. I would have done that before I moved. I lived very near NW Indiana. That's my cause too.